Top Spanish architecture by intelligent design for Tenerife properties. This Spanish architecture was captured on camera late in the evening. The architectural appeal is of good taste and gives you practical house design of modern town houses. 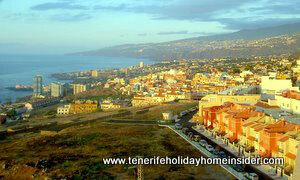 The birds' eye view of the construction of the attached Tenerife houses speaks for itself. Heating or airconditioning: n/a with climate of Tenerife. The upper road pictured is the long mile road Los Realejos Longuera with more traffic which runs parallel to Calle Jasmin. There, a brand new soccer stadium with artificial lawns is only a minute from the building complex shown. superb mind which meant to save in building material expenses and above all in valuable cost of land. By the way, look at the little bend in the road at the end of the townhouses Longuera Realejos with their individual color scheme from red to beige. Turn right there and get to La Longuera with its excellent infrastructure. Also, make out another row of off white houses of different style in the sloping section of Calle Jasmin. It appears after the road junction. There, the same Spanish architecture with inside yard and underground parking was created for attached houses. Also, the same sharing by two rows of townhouses of different streets was used. All this gives you about 600m of peaceful road with enchanting looking Casas (houses) adosadas (attached) which face empty fields and the Atlantic ocean beyond. Only Tenerife mountain goats graze on this land of low bushes and wild grass. Now, the animals are being taken to higher, greener grounds since drier summer weather has arrived. A friend and I walk almost every night in this serene road, where we enjoy the the evening light. Lone cats and children seem to be happy there. Pedestrian walks are quite wide and invite for dog promenades too. Goats often graze behind the fence or get out to walk the street, occasionally. Plenty space between small trees allows for roadside parking. empty fields opposite the practical Spanish architecture look off limits, as all is fenced in. Enter by the gate beside Hotel Panoramica Garden. But, protect your legs with good boots. Why? Eventual ticks or fleas may lurk there. Needless to say is that your dogs need insect protection too. Unused space or Los Realejos park? Have stunning views from the modern townhouses of Calle Jasmin. See the ocean, part of the Orotava bay, Romantica II, Toscal Longuera and part of Puerto de la Cruz. The latter is only 7 minutes away from the convenient and clerverly built Spanish architecture Tenerife. You may even spot the peak of Mount Teide. Occasionally, one or more of the townhouses in the quiet Calle Jasmin have for rent or for sales signs outside. The Spanish architecture of this part of Los Realejos was superbly designed to serve well as a holiday home in Tenerife for yourself or to rent out. 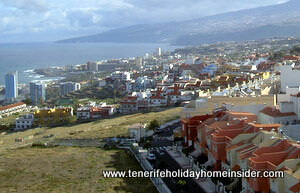 Should you be interested in the above praised Tenerife properties, contact me, as I may be able to help. However, I wouldn't assist you fully, unless you were already in the area, as it could mean much work and running about. 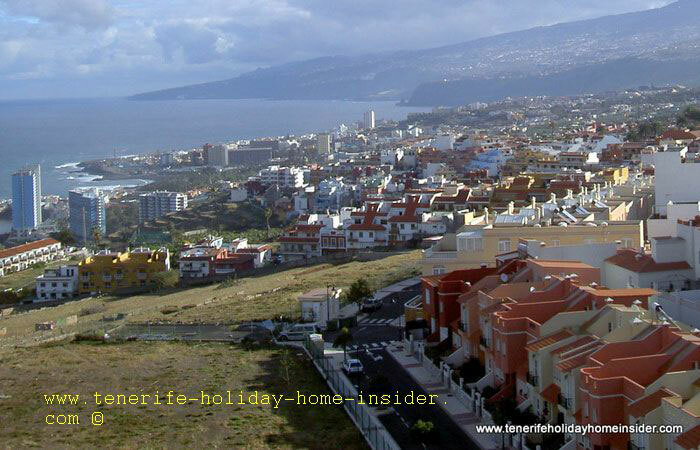 Don't forget that it's a good time to rent or to buy Tenerife property now. From Spanish architecture back to La Longuera in the subtropical north Tenerife to learn more about this cosmopolitan suburb of Los Realejos by Puerto de la Cruz which has so much to speak for it, such as an athletics' stadium, schools, restaurants, shops, banks, bus lines, taxis, beaches and more attractions nearby. Totally different Spanish architecture by a the Adeje Gran Hotel Mirador and Bahia del Duque with its fairyland style for enchanted Tenerife vacations.